TRU Group Inc was first engaged to facilitate the strategic planning at Agile Systems and later was commissioned to undertake the USA market study for the company products. Agile Systems Inc, a high-tech start-up that designed the innovative Hybrid Stepper Motor Drive Controller was acquired by Allied Motion Technologies Inc, Denver, CO, USA in 2010. Both the stepper and servo motor segments are mature and are projected to grow at a rate on average of only 2% per annum between 2005 and 2008. This low growth rate is at about the historic norm and indicates that the target market for drives is also mature; therefore high competition and strong price sensitivity should be expected. The “test and measurement industry” is highly fragmented with thousands of companies serving a multitude of specialized niche markets from basic scales and thermometers to complex semiconductor and optical test equipment. It is estimated that there are more than 3,600 test and measurement companies in the United States which is the largest producer of this equipment in the world. There were eight “closed loop stepper motor drive” competitors active in the United States identified in this study and two other powerful competitors who claim to sell servo-like drives but imply closed loop operation of those drives. 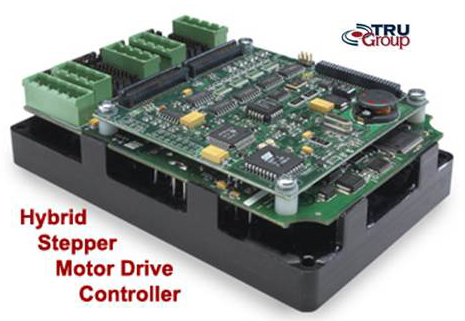 A high proportion of the stepper drive market is captive since machine builder users have their own low cost stepper motor drive systems. Steppers are specified based on peak torque requirements at a "reasonable" working voltage. Generally, this voltage is always below 72V for UL reasons. The current and the torque are related. In fact, the stepper always draws the current required for peak torque so its operation is always inefficient. When a stepper is specified, there is always a torque cushion to ensure that the stepper does not loose steps. If steps are lost, then the machine does not know where it is and the machine must be reset using some sort of mechanism for this. By using peak torque that is well beyond the maximum expected torque, steps are never lost. This is a basic design idea for stepper motor specification. Steppers are then specified using two main parameters – peak torque plus cushion and voltage. These two parameters are how a designer selects a stepper motor in general. Other criteria might be the number of steps or micro-steps per revolution which would relate to the positional resolution of the motor and drive system. Another factor is the maximum pulse rate that the drive or amplifier can accept or in other words, the maximum velocity or RPM of the motor. There is three retrofit options for machine builders which want to exploit the DEVICE technology. The first approach simply replaces their existing drive with the the DEVICE drive and the second replaces both the drive and the motor. The third option replaces the drive, motor and controller which generates the pulses for step and direction input. As stepper drives are phasing out step and direction inputs in favor of motion libraries and ethernet interfaces, future retrofits might look at the third solution, but today, the first two retrofit solutions seem to be most likely. It is assumed here that the retrofit offers the DEVICE features of noise reduction, resonance reduction and improved speed through field weakening. It is also assumed that the user will setup the DEVICE drive with the correct stepper configuration parameters to configure the drive and will also tune the drive before starting operation. (Agile is working on auto-tuning tools which can be used in no load and load situations.) Drive Replacement This is the simplest case where the drive is replaced with a the DEVICE drive. In this case the motor is rated for the peak torque plus cushion and the voltage is known. The replacement the DEVICE unit would then have the same parameters that the user knows is in use for the existing motor in terms of voltage and current. Note that when the user specifies the current as the maximum torque plus cushion current then the SS drive will be able to deliver this same maximum torque but can do it without drawing this current on a continuous basis. This represents significant energy savings in addition to the other SS benefits. The maximum speed or throughput improvement for a specific application must be measured for that application. Because of the way that SS runs in stepper mode and switches to the DEVICE mode, the only way to get a handle on this is to exercise it with the application. In general, where the high velocity portion of time is high in the machine, the greater the benefits of SS if the machine could benefit from higher velocity. The effects of specifying a substantial cushion on the peak torque limit mean that the initial motor was specified as much too large for the application compared to the specification of a SS solution for the same machine. When retrofitting, there is also an opportunity to reduce the motor size substantially, without affecting the performance and while still achieving the SS benefits of reduced noise and resonance. In this case, the designer of the retrofit kit should select the peak torque limit without a substantial cushion – rather use a small cushion. Then the motor is much smaller and cheaper. The SS drive can be selected to support the selected voltage and the peak current required to generate this peak torque plus small cushion. In this case, the user will get noise reduction, substantial energy savings, resonance reduction and stall prevention with a greater top speed and a lower overall system cost. In this case, no changes are required to the system software. To use the DEVICE to run the stepper will require a complete rewrite of the user's application. As such, this is not regarded as a viable option for the retrofit market unless the user is desperate to change platforms.